Prom T-Shirts are a great way to commemorate what is sure to be one of the most memorable nights of your high school career. They're also incredibly easy to make yourself, or to custom design and order through a T-shirt printing company. If budget is a concern, going the do it yourself route is more cost-effective and can be a fun project for a group of students to tackle together, but if time is of the essence, using a T-shirt printing business may be the way to go. If you're even slightly artistically inclined and have some spare time, creating prom T-shirts yourself or with a group of friends is a cheap and easy way to always have a souvenir from your prom night. In only a few steps you can have a T-shirt to hand out to all prom goers after the event. After determining how many T-shirts you will need, you can save money by buying them in bulk from an online retailer. Create a logo or a slogan that reflects your prom theme, year and high school name. This can be done on a piece of paper and then scanned to your computer, or you can work directly on your computer in a program such as Photoshop. Print the finished logo or slogan on transfer paper, which you can purchase at major retailers such as Walmart in the computer paper section. Place the T-shirt on an ironing board and place the transfer paper image side down onto the prom T-shirt. Be sure to put a brown paper bag inside the t-shirt under the transfer paper, otherwise the image will transfer to both sides of the shirt. Set the iron to the correct temperature per instructions on the transfer paper and iron the image onto the T-shirt starting from the outer edges moving toward the center. Let the T-shirt cool for a few minutes before removing the transfer paper. If you have a larger budget or just want to save some time, online companies are basically one-stop shops because you order the amount of prom T-shirts you need and have them printed all from the same online store. 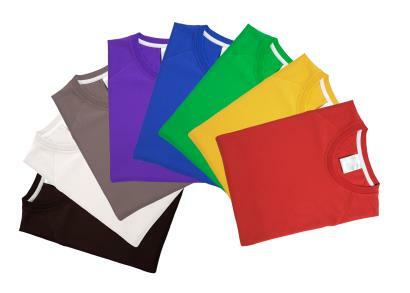 Select the sizes and color of prom T-shirt you need. You can never go wrong with white, black, navy or any other neutral color. Upload a custom image in electronic format such as JPEG, bitmap or GIF file to the website. Choose your font style and accent colors. Finish off by selecting the quantity, shipping instructions and payment options. Prom T-shirts are not only a fun way to create school spirit and get everyone excited for prom, but they're a great way to always have a memory of one of the last nights with your entire high school class. They're very easy to make yourself and can be a fun after school project for the prom committee, but if you're in a time crunch, ordering from a T-shirt printing business will guarantee professional results in only a few days. With either method, your T-shirt will surely be something you will hold on to for many years to come.